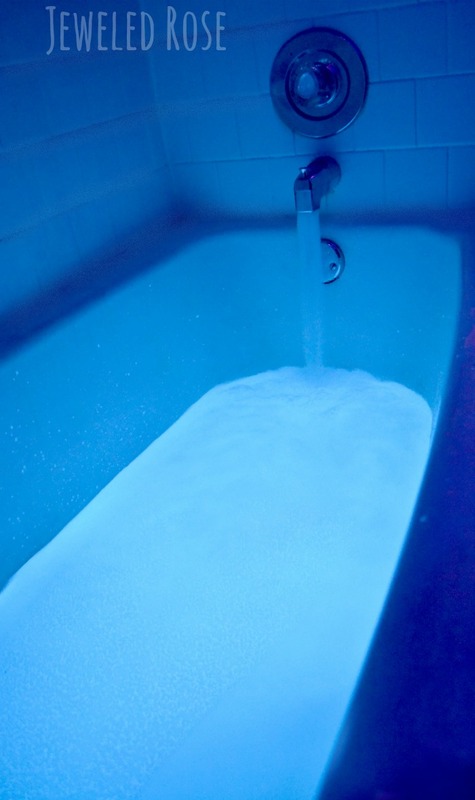 While we loved our Glowing Outer Space bath, some people expressed concern for the safety of using the glow water in this way. 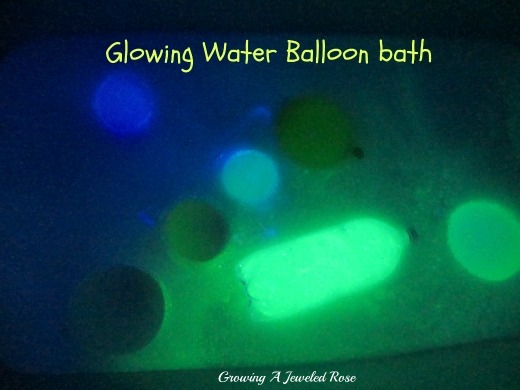 So, if adding the traditional glow water directly to your child's bath water makes you a little uneasy, here are a few alternative ways that we have made bath time GLOW! Then flip the lights off and the blacklight on. Easy peasy and SO FUN! My girls always have a blast when we make their bath glow. If you don't have a blacklight they are very inexpensive, and there are tons of ways to play with them. You can get the one we use online here. You could also use tonic to make an outer space bath. 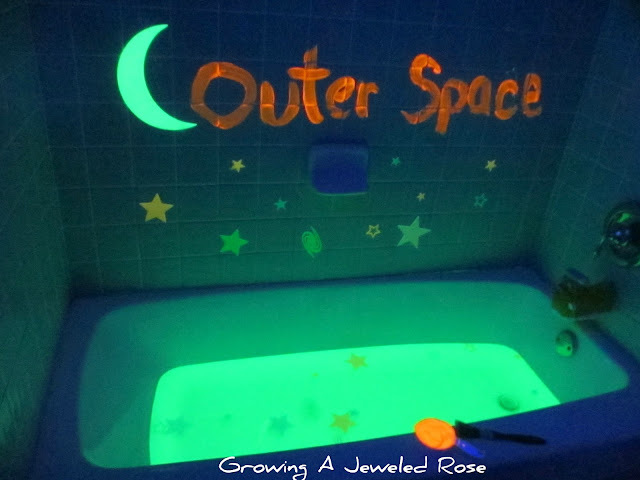 I added submersible lights, glow in the dark stars and planets, and fun space paint to make this bath time one that was truly out of this world. 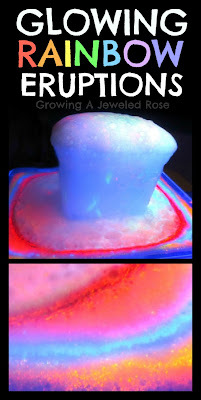 You can use tonic water or traditional glow water to make these. Just fill an empty, seal-able container with glow water, or peel the label right off a a bottle of tonic, and you are ready to PLAY. 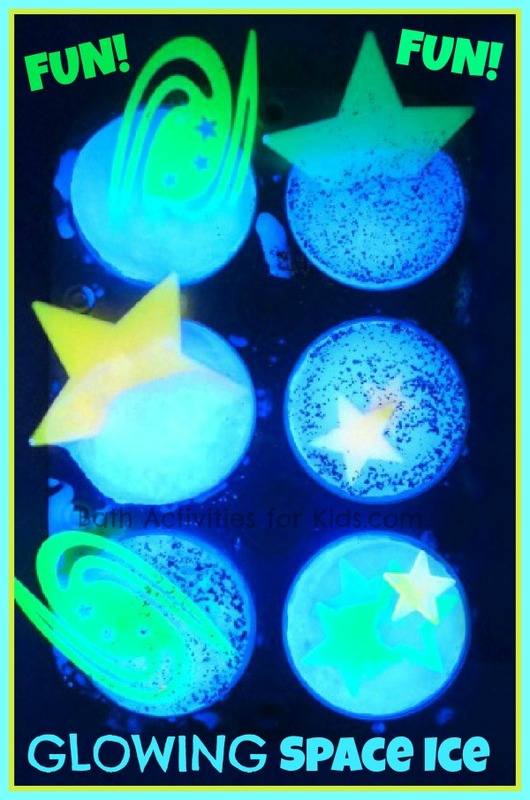 You can also use RAINBOW glowing water to make a variety of glowing bath light colors or use glow in the dark paint to make glow in the dark GLOWING lights using the rainbow water recipe. The glow in the dark variety would be tons of fun for the pool! Rosie was really captivated by the GLOW light- it lit the room much more than the submersible LED lights we have bought. 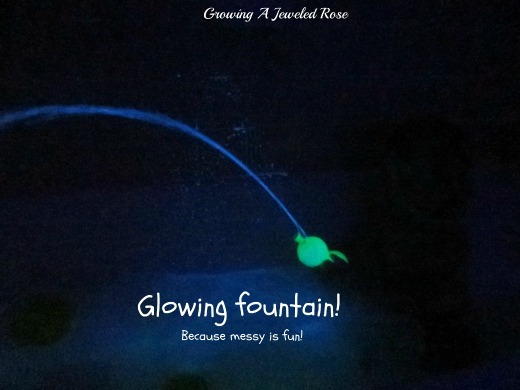 After the kids are done playing with the submersible lights you can use the glow water for so many other fun things. 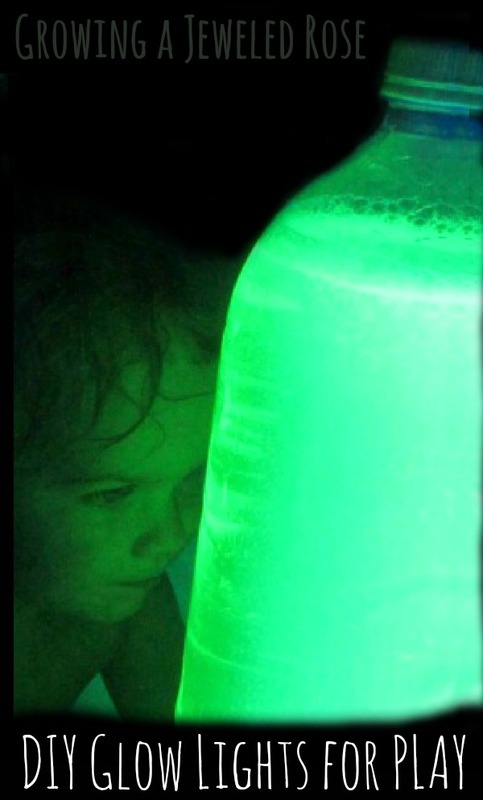 Check out the blacklight themed play date I recently hosted for ideas. 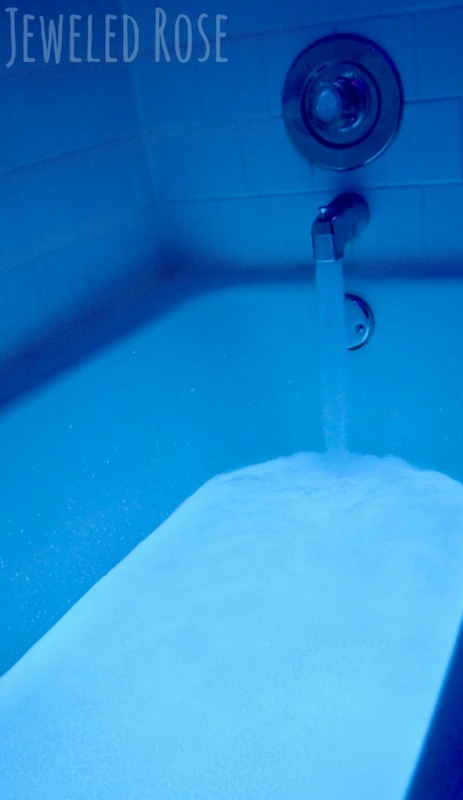 We used tonic water to give this bath beautiful glow. 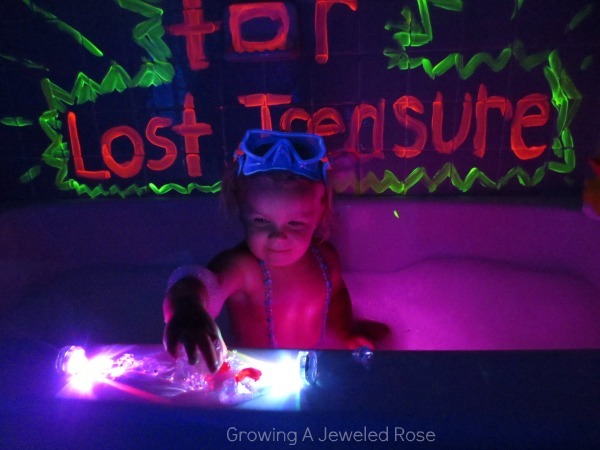 I hid glowing treasures under a blanket of illuminating bubbles, and Rosie had a blast pretending to be a deep sea diver as she found the treasure. So magical and fun! 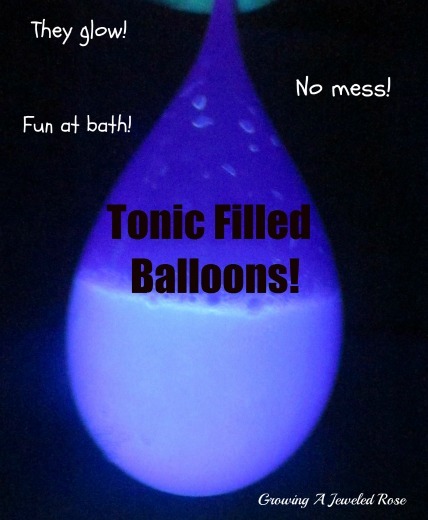 Another great way to have fun with glow water or tonic water at bath is to fill balloons with it. To fill the balloons we used a two liter bottle. We secured the balloon to the lip of the bottle, then flipped the bottle upside down. I held the balloon in place, while my husband squeezed the bottle. Then, we simply pulled the balloon off, and tied it. Very easy. The tonic filled balloons were the girls favorite. Rosie loved chasing the glowing balloons and shaking them to make them fizz. What could be more fun than chasing slippery glowing balloons around at bath time? Popping them right before the play time is over! Oh my, was this fun! We popped all the balloons one by one, and Rosie had a blast painting the walls with her glowing fountains. After, the bath water and walls looked incredible! Please note- after these bath play times children should be given a proper bath for getting clean. 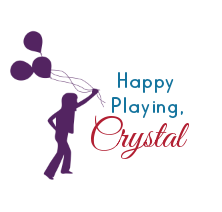 Always supervise young children around balloons and water in general, not just glow water. Rosie and Jewel are always closely monitored during play times like this. All the mess from these play times washed straight down the drain. They did not stain the bath or skin. 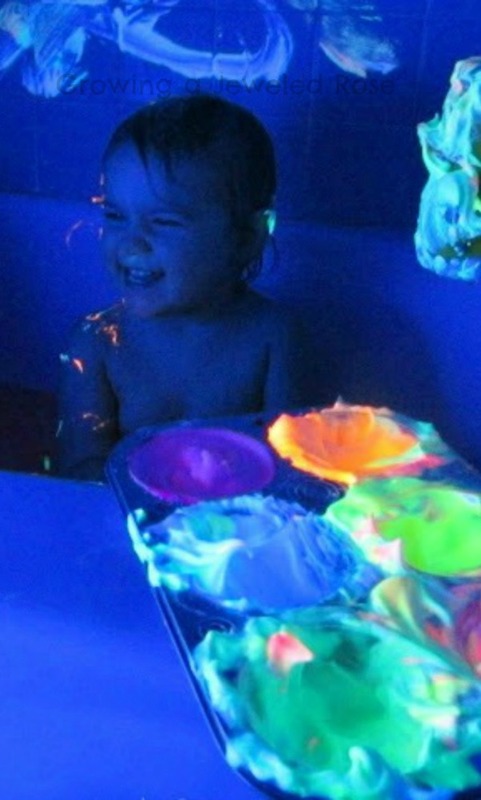 Also note- you do need a blacklight for these play ideas. We got ours online here. There is also a wide variety available online here. We use our blacklight all the time. 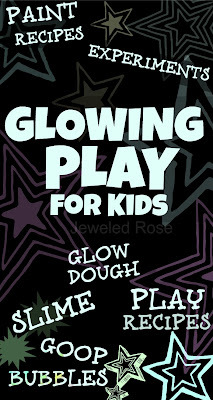 Visit our glowing play collection for TONS of ways to play with a blacklight.